4470 & 4472 Taper Thread Plug with Round Cover - Jay R. Smith MFG Co.
Used in Female Pipe Size openings in Drainage piping where a cleanout is required. Countersunk plugs have slot sized to receive 1/2"(13) thick steel bar stock. Face-of-wall cover is desirable on finished walls. 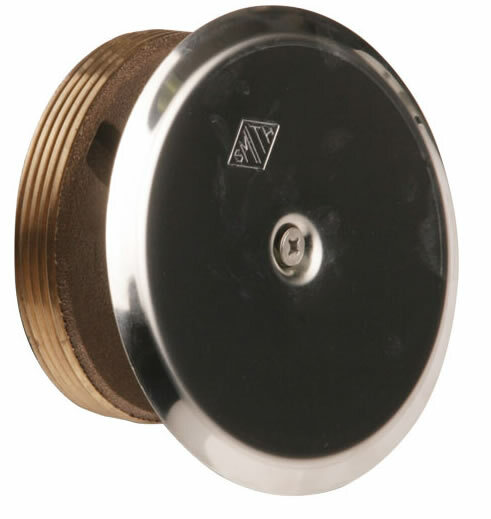 Cast Bronze Taper Thread Plug with Stainless Steel Round Cover and Screw as indicated by Figure Number. Smith No. 4420 cast iron ferrule with countersunk bronze plug. Smith No. 4470 for plug only.